Chonnam National University (CNU) has been successful in educating international students. It has been accredited for three consecutive years as an excellent institution in recruiting and managing international students by the Government. As of April 1st, 2015, CNU has 978 international students and the number of foreign students has been increasing. However, some foreign students seem to have difficulty in obtaining information about school affairs and for daily life on campus. 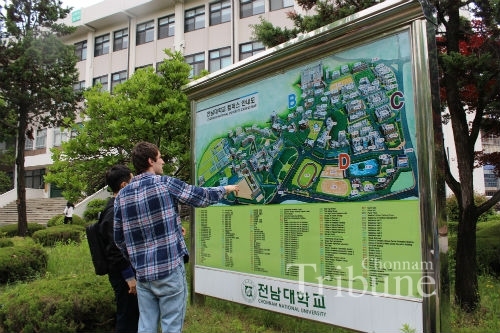 The Chonnam Tribune looked into the difficulties foreign students have at the university. ▲ A Korean student is helping a foreing sudent to find a building on CNU campus. CNU offers support programs and useful information to help foreign students adjust to school and to integrate into campus life. The Office of International Affairs (OIA) holds orientation sessions to give them brief ideas about the university and general information and provides the University Guidebook written in English and Chinese. The one-to-one student buddy program is also offered so that they can get help from Korean students. For those who want to use the library database for reading materials, the Library provides a library use education program once every semester in order to help them know how to use academic materials including books and journals, and how to borrow books, not only those available at the library but from other Korean universities. Besides, different colleges and departments have various programs such as round-table conferences for foreign students to make their campus life comfortable so they can obtain general and useful information concerning academic and student affairs. When registering for regular courses and take e-class courses on CNU’s portal site, international students have trouble. Tri Anissah Arfiani (Freshman, Dept. of English Language and Literature, Indonesia) said, “It is hard to use e-class without a Korean buddy’s help. The most difficult thing is the language barrier because except a few menus of e-class, the portal site is offered in Korean.” When registering for classes, the OIA sends foreign students a full list of English classes and then replaces their registration. For the course add or drop, the office offers Korean buddies to help them add or drop classes. Also teaching assistants are resident at the office at the beginning of the semester. The OIA said that it is difficult to operate both Korean and English versions of the portal site at present since only about 300 foreign students are using English, however, as incoming students are increasing, we should think about other ways to solve the problems. Some students have difficulty in using the word-processing software application, ‘Hangul’, which is used extensively in Korea and its file extension is hwp. The reason is that most documents regarding academic and student affairs on the websites are Hangul documents. Wien Ting Ting (Graduate, Dept. of Pharmacy, China) said that “I never heard of the program before coming to Korea because Chinese people use MS Word. So I had to search on the Internet to figure out what the program is. Hangul’s function is different from MS Word.” A foreign student said that it would be a good idea to offer an information session about the Hangul program before school started. It is not easy for foreign students to find the buildings on campus when they do not know the Korean language. Shinmend Sophannaoa (Junior, Dept. of Bioenergy Science and Technology, Cambodia) said, “Sometimes I have trouble finding buildings on campus. The signs of buildings are offered only in the Korean language, so I had to ask other students to help me find the building. I think the university needs to offer English signs for international students studying at CNU.” According to the OIA, both Korean and English languages have been written on the road signs together starting this year. Cho Joon-sik, director of the OIA, said that “English signs are attached on the side of buildings and located on the roads on campus but their size seems to be so small that they are not easily noticed. We are considering finding efficient measures to the problem.” What about announcements in the Residence Halls? Elif Goksu (Sophomore, Dept. of Korean Language and Literature, Turkey) said, “I know the Korean language but I cannot understand an announcement in the dormitory even if I listen to it carefully.” According to the Residence Hall, announcements are offered in both Korean and English for foreigners. 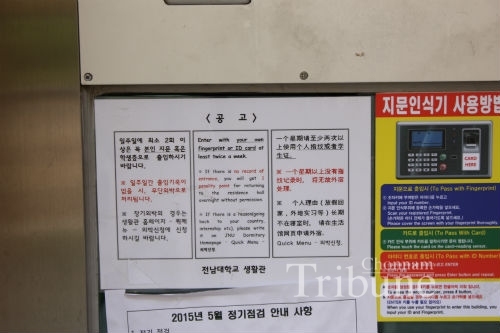 They also post important notices on the front and inside of elevators in dormitories in both the Korean and English language. Some foreign students, including Muslims who should not eat certain kinds of food, have difficulties in choosing their meals at on-campus restaurants because the menu is given only in Korean and they do not include ingredients of the food. Sarah Phalosa (Junior, Dept. of Communication, Indonesia) said, “It would be better if the school offered an English menu for international students. I cannot eat pork for religious reasons and sometimes rice is the only thing I can eat. I hope that the school will also write the daily menu in English.” However, the Office of Student Affairs said that it is difficult to use both Korean and English menu simultaneously because of the problem translating some Korean food names into English. Therefore, they have requested on-campus restaurants to write down only ‘beef’ or ‘pork’, two types of meat that are used in the food on their menu. 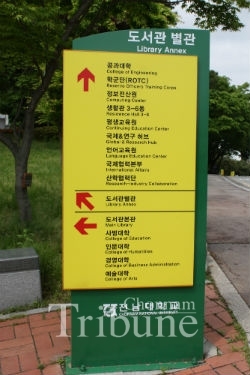 Consequently, Haetdeulmaru, a cafeteria near Residence Hall 3 offers a menu with ‘pork’ or ‘beef’ in English and the cafeteria at Student Union 1, when foreign students ask, its staff member choose one menu item for them. Many foreign students seem to be satisfied with CNU’s support programs and services. However, some students have difficulty in obtaining information about school affairs and pointed out that CNU authorities need to provide bilingual information. Regarding these problems aforementioned, Shin Ju-hyun, a staff member of the OIA, said that they have made an effort to strengthen business cooperation with the relevant offices in order to offer proper support services for international students. The population of international students will increase in the future. Therefore, it is necessary that CNU authorities consider the current information providing system for them and pay more attention to their campus life. If so, CNU will become an international student-friendly campus and one of the leading universities in the world.